LOUISVILLE, Ky. (WDRB) -- If you're coming into or leaving Louisville, you'll probably end up using Ninth Street. 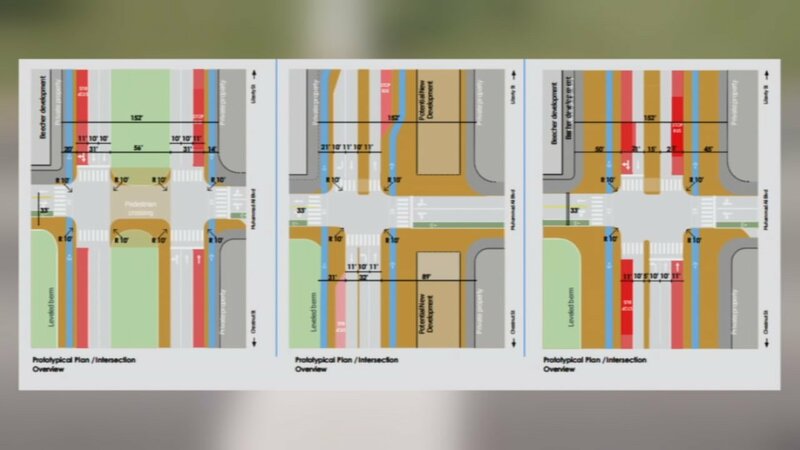 "This is a big connection to the interstate," said Gretchen Milliken, Louisville Director of Advanced Planning. "It's a big north-south connector as well." The well-traveled thoroughfare between the Ohio River and Broadway is on the verge of a new look. "We started seeing there's a lot of potential, there's a lot of opportunities with this corridor, to make something more than just a large vehicular corridor," Milliken said. There are three different plans that could be used. Re-configuring the road and the green space are both on the table, as are new amenities for the city. "Larger sidewalks, parkways, bicycle lanes ... even a transit lane," Milliken said. Similar projects in Montreal, Toronto and Naperville, Illinois, have worked. Locals are ready for a similar transformation. "I look forward to seeing some change," said Rick Hayes, who lives in Louisville. "Finally, people will have pride in their neighborhood." City leaders say the most important part will be bringing people together. Many people see Ninth Street as a divide between downtown and west Louisville. "(The Russell neighborhood) could benefit from having more contact with downtown, and people downtown would benefit from having more contact with the Russell community," Milliken said. The project hasn't officially gotten the green light just yet. In fact, completion will still be years down the road. Opinions on the project are still welcome. You can share yours here.